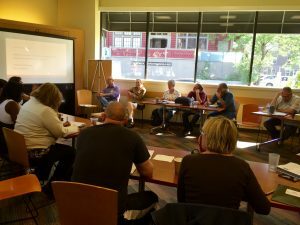 Last week, five groups from Washington State and California came together at Recovery Café in Seattle to launch the Inaugural Recovery Café Network Cohort with the goal to open Recovery Cafés in their cities. Groups from Spokane, Tacoma, Vancouver (WA), Everett and San Jose (CA) joined the charter two-year cohort. Each group brings dedication to support the recovery journey as well as years of experience in the social services field. This two day training was the culmination of countless hours of hard work and a lot of heart.